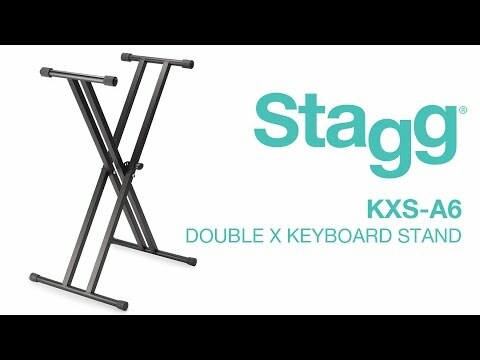 The Stagg KXS-A6 is a sturdy, great value keyboard stand. Great Value, Sturdy Keyboard Stand Fully Adjustable The KXS-A6, despite being a ch.. The Stagg KXS-A6 is a sturdy, great value keyboard stand. The KXS-A6, despite being a cheap keyboard stand, is a solidly built stand with some great features. For optimum comfort while playing there are five different height positions ranging from 60 to 99cm (27” to 39”) to suit your height with a tough safety lockpin reliably securing your adjustment. Being a dual “X” keyboard stand, the KXS-A6 features a double X style bracing for extra sturdiness. With a maximum load capacity of 30kg (or 66lbs), the KXS-A6 Stagg keyboard stand is suitable to hold almost any keyboard. This keyboard stand features eight non-slip grips; four on the feet to keep the keyboard stand from moving and four on top to keep your keyboard firmly in place.The five-position adjustable height system is locked in with a safety lockpin for secure and reliable mounting of your keyboard so you can play with confidence. With its minimalistic, sleek black look, the KXS-A6 keyboard stand fits in everywhere and goes well with any style of keyboard. It’s light weight, sturdy and comes in at a great price point. A good value keyboard stand.